Confused? 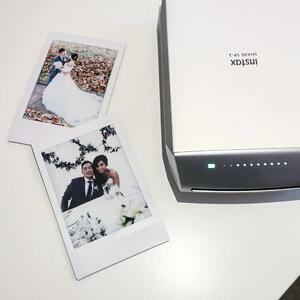 Are you wondering why on Earth you would want to do that when you can snap and print with your instax camera? And that’s where the instax SHARE SP-2 comes in. Imagine a printer that’s just a little bigger than your mobile. The SP-2 is about 132 mm long, 90 mm wide and 40 mm thick. It prints rectangular photos that are 62 mm by 46 mm at a resolution of 320 dpi—and it does so in a mere 10 seconds. The best part? You just print wirelessly from your phone or tablet. Let’s take a look at how this could all work for you. Imagine you’re planning a trip to New Zealand where you’ll be biking, hiking or kayaking every day. You can slip your phone in your pocket or backpack, take all the amazing photos you want and then print them when you get back home or back to your hotel. But’s let be real. The SP-2 is small enough that you can easily throw it in your backpack, too, allowing you to share your shots with people you meet as you bike the West Coast Wilderness Cycle Trail or climb to the top of Roy’s Peak in Wanaka. A few more things to mention: The SP-2 allows you print collages of up to four photos—and also split images into two photos. The new SHARE app allows you to adjust brightness, contrast and saturation. In addition to printing from your phone, you can easily print from your Instagram and Facebook accounts. And that’s just the start of the fun. Templates allow you to crop your photos into squares, number your prints to look like limited editions and “stamp” your photo with the date, place, weather, temperature and humidity. It all adds up to give you options—and that’s always a good thing.